April 2, 2018 | Cromwell, CT – The Everyday Hero CT volunteer firefighter recruitment campaign, in partnership with Hebron volunteer firefighter and New York City-based cinematographer Matthew Troy, today launches “See You Out There,” a recruitment public service announcement that brought some Hollywood to Connecticut last August during three days of production. The PSA can be seen beginning today via social media and other online platforms, television, and various partnerships. 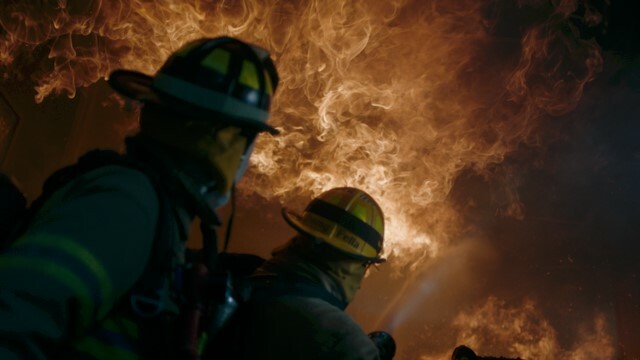 Designed to increase awareness and visibility for the volunteer firefighter shortage in Connecticut, 30-, 60-, and 90-second versions of the PSA include captivating footage and visually groundbreaking moments as well as feature fire personnel from 16 different departments, including at least one from every county in Connecticut. The Everyday Hero CT program is proud to release the PSAs and the members of the steering committee are excited to see the impact it will have throughout Connecticut – from changing the way people regard their local fire departments and their neighbors who volunteer to igniting (no pun intended!) people’s passion to step up and lend a hand. Connecticut has more than 300 fire departments staffed by over 26,000 firefighters, 83 percent of whom are volunteers and are professionally trained. Volunteer firefighters can be called upon 24 hours per day, seven days per week to abandon the warmth and comfort of their homes in the middle of the night or during a holiday celebration, leave the fun of family gatherings on sunny summer afternoons, enter burning buildings, rescue stranded hikers and struggling swimmers, extricate victims from automobiles, and more. Volunteer firefighters save their communities millions of dollars every year. The majority of fire departments throughout the state are experiencing a volunteer shortage. Local fire departments need volunteers of all skill levels and abilities, people willing and able to respond to emergencies whenever called upon, as well as support personnel such as fire police, administrative assistants, and more. Everyday Hero CT, a program dedicated to increasing the number of volunteer firefighters throughout the state. A partnership of the Connecticut Fire Chiefs Association (CFCA) and the International Association of Fire Chiefs (IAFC), the Everyday Hero CT campaign is a Volunteer Workforce Solutions (VWS) initiative designed to address the shortage of volunteer firefighters in Connecticut. It is helping achieve a viable and sustainable volunteer firefighter workforce for fire departments throughout Connecticut. Everyday Hero CT is funded by a Staffing for Adequate Fire and Emergency Response (SAFER) grant awarded to the CFCA by the U.S. Department of Homeland Security’s Federal Emergency Management Agency (FEMA) to develop a model to enhance the recruitment and retention of volunteer firefighters.